The following was first posted July 31, 2014. It was a hit back then so it is being reposted at Tony's request for those who might have missed it. 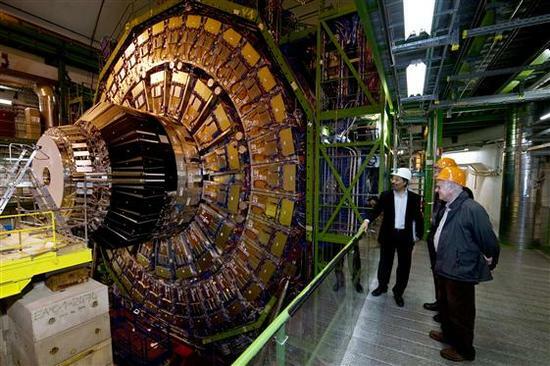 Two years ago this July, the scientific team at CERN, the European Organization for Nuclear Research, used the Large Hadron Collider (LHC) to confirm the existence of the Higgs boson, the most important "missing" particle of the Standard Model of modern particle physics. The work of the CERN team was filmed by theoretical physicists Mark Levinson and David Kaplan, who used over 500 hours of film footage to create a 99 minute documentary, Particle Fever, which was released in July 2013. The film is a joy to watch. I especially liked the use of the chorale movement of Beethoven's Ninth at the moment on 4 July 2012 that the LHC provided evidence of the Higgs boson. If you need a lift; if you need a break from all the mayhem and madness of today's politics; if you want to weep tears of joy, watch the film. A computer generated map of the particle paths generated by a collision of two sub-atomic particles traveling near the speed of light. Source: CERN Press Office Photo Selection. Now, I can't decide if Levinson and Kaplan have done a greater service to humanity by providing a popular and entertaining explanation of the quest for the Higgs boson, or by allowing some unnamed arrogant economist, in a few short breaths, to show us quite precisely what is fundamentally wrong with modern economics as a discipline, and the whole cult of conservative / neo-liberal economics thinking that demands everything be justified solely by its ability to create a "profit." Again, you have to watch the film to see how perfect is Kaplan's reply. �Basic science, for big breakthroughs, needs to occur at a level where you�re not asking what is the economic gain, but where you�re asking: What do we not know?� And, Where can we make progress?" (The next scene in the film is great, showing one of the five story tall arrays of electronic sensors and instruments, all custom designed and hand soldered, but I digress. I will, however, toss in these great pictures from CERN to give you an idea of the epic scale of the LHC. View inside the particle accelerator tunnel of the Large Hadron Collider at CERN. Source: CERN Press Office Photo Selection. One of the massive instrumentation clusters of the LHC at CERN. One of the observers in the picture is a very special person. Can you guess who? Source: CERN Press Office Photo Selection. The exchange between Kaplan and the economist goes to the heart of an issue I have been struggling to elucidate for the past couple years. I want to tie together in one neat package the creation of the United States as a constitutional republic, what the political economy of a republic should be, and the centrality of science to republican political economy. The obstacle I find is that the most important economic activity any society undertakes -- the creation, dissemination, and application of new scientific and technological knowledge -- is not even taught as basic economics. Everybody has been mis-educated (perhaps mal-educated would be a better word) about economics. For example: what is wealth? Is it really hoards of cash, or stockpiles of precious metals? Consider: Why do we have computers now, when there were none 200 or 500 or more years ago? Certainly, 500 years ago, all the raw materials that go into making a computer were available. There was lots of silicon laying around, and there was a lot of petroleum, with which to make plastics, sitting in the ground. There was the same presence of germanium and silver, and copper, and whatever else is needed to make a computer, 500 years ago, as there is today. What is so different today that we can make computers now, but could not 500 years ago? The answer, of course, is knowledge - we first had to develop, acquire, and master, the various facets of science that allowed us to make use of those latent natural resources, then apply that science to actual physical processes of production, or what we call technology. So what wealth really is, is the human power of thinking: reason, investigation, hypothesizing, testing, figuring out why things are the way they are -- and then figuring out how that new knowledge can be used to change the way things are. If you start off with a mal-educated idea of what wealth is, how can you possibly ever measure how wealthy a society is? Here's a little mental exercise. Assume one day in the not too distant future the most extreme candidates of the Tea Party / conservative / libertarian / Republican elements of the US population come to power, and they enact a law deporting all scientists and engineers who refuse to take an oath repudiating evolution, the science of climate change, and the idea that the world is older than 6,000 years. What would be the impact on US gross domestic product in five years? In ten years? In 20 or 30 or more years? Do you have any doubt that in that sort of Tea Party dream land, the United States would inexorably slide into technological atrophy, then economic collapse you can�t even imagine, and finally violent social upheaval? Without the constant development of new science and technology, any society will become impoverished, and will eventually collapse. Jared Diamond�s book, Collapse: How Societies Choose to Fail or Succeed, examines how societies descend inexorably into collapse when they ignore environmental limitations and mismanage their natural resources. The key point that most readers of Diamond miss is that a society�s environmental limitations are defined only within a fairly specific period of time based on the prevailing technological mode of that society�s economy. Any society that remains stuck in one technological mode will eventually bump up against environmental limitations: what is considered a resource and how much of it is readily available and usable. All an economy really is, is how a society organizes itself to procure and process raw materials (natural resources) to create and distribute what is needed to sustain and reproduce human life. And this is true even for societies that are not technologically advanced, and which we think is �sustainable.� Because, how do we know it�s sustainable? We need some measure of that society�s capacity for transforming natural resources into useful material and services, and we need some measure of the resource base of that society. You cannot get such measures without some level of science, and science applied as technology, to get at the answers. Unless you�re willing to settle for this method of measuring such things: Wait and see if a catastrophic extinction event occurs or not. If and extinction event does not occur, congratulations you have developed a sustainable economy. If it does occur, well, saying �oops� just won�t cut it. And what if the extinction event does not occur until the next generation? So the most important economic activity a society engages in is the pursuit of new scientific and technological knowledge that allows that society's economy to avoid environmental limitations and inefficient misuse of natural resources. This is one of those wonderful, mysterious paradoxes of life: basic scientific research has no measurable immediate payback but nonetheless is THE most important economic activity that occurs in a society. Recall Kaplan's answer to the economist. In the United States, there are already many indications and markers of our collapse. Since the social shift from a market economy to a market society began under Ronald Reagan, we've spent three decades now matriculating nearly twice as many MBAs and accountants, as we have biologists, physicists, mathematicians, and engineers. Industrial companies that took a half century or more to build up a level of technological excellence that was formerly envied around the world, have been bought and sold and bought and sold, restructured, reorganized, streamlined, had the fat cut out, had hidden value released, downsized � call it what you will, the truth is those companies have been asset stripped and looted. We�ve been doing that for nearly half a century now. Since Reagan�s first election, our national debt has increased by a factor of double an order of magnitude, from just over $900 billion, to nearly $17 trillion. Our trade balance has been increasingly negative. These are all not independent phenomena and developments; they are all inter-dependent in a complex web of cause and effect that, if our society were sane -- instead of crazed with the market fundamentalists' worship of mammon -- some of our best scientific minds would be devoted to investigating and understanding. Instead, we have allowed a banking and financial system, "deregulated" from any responsibility or concern for the general welfare, to induce many of our best scientific minds to create credit default swaps and other financial instruments of mass destruction. So, science is the most important aspect of the political economy of a republic. Why is this so hard to understand? Part of the problem here is that when the United States was founded, the concept of capitalism, as we know it today, had not yet been fully formed. That would happen over the next century. You can search the texts of the Constitution and The Federalist Papers in vain for the words "capitalism" and "capitalist" (thank God for archived books and computerized search functions). The word "capitalism" did not really come into common usage until after Marx's Das Kapital was published in 1867. I have never agreed with the interpretation of American history, most popular on the left, that the United States was founded as an irredeemably oppressive and exploitative capitalist system. The very concept of capitalism was unknown at the time of the nation's founding, so how could the country be founded as a capitalist economy? I am not about to deny the obvious ugliness of much of U.S. economic history. But I think we blind ourselves to our true enemies if we don't realize that the US economy developed in the context of a continual battle between republicans and their enemies, oligarchs and aristocrats. These last were not necessarily titled nobility, though there was no shortage of those. And make no mistake, they wished only ill for the US. There were also commoners, nominally citizens of the US republic, whose avarice and greed for power made them the functional equivalent of oligarchs. Closer to our time, Franklin Roosevelt called these deformed creatures "economic royalists." Today, "Wall Street" and "the one percent" are terms often used to denote these "economic royalists". It�s about time we begin to take seriously the concept of �domestic enemies� mentioned in the Constitution. So as the US economy developed, there raged a fierce, often bitter contest, between progressives who looked to the Founders for inspiration on the one hand, and, on the other hand, reactionaries, revanchists, and perhaps most often, simply self-centered pricks, who hated the ideas of self government and the general welfare because those ideas created manifold obstacles to their drive to accumulate wealth and power. 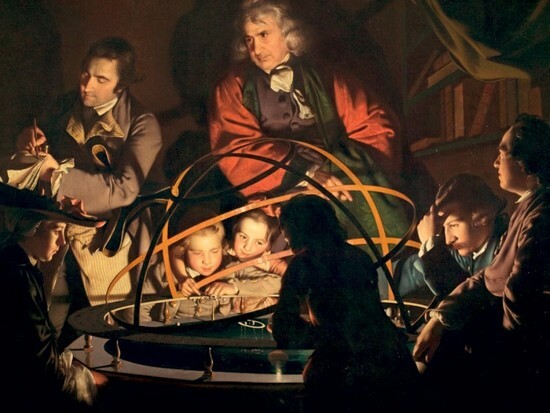 The Orrery, by Joseph Wright of Derby, 1766, used as the cover illustration on Tim Ferris's book, The Science of Liberty: Democracy, Reason, and the Laws of Nature. An orrery is a mechanical model of the solar system, showing the motions of the planets, though rarely to scale. Professional scholars have been slow to study the progress of science and technology, partly because of their penchant for political [and military] history, and partly because, even with the rise of social and intellectual history, they have been daunted by the unfamiliar and formidable subject matter. At certain points, it is true, they have touched upon epoch-making mechanical inventions which had self-evident economic consequences, but these occasional references fall far short of depicting the pervasive and continuing role of science in all ranges of American life. -- �An American Historian Looks at Science and Technology,� in Early American Science , edited by Brooke Hindle, Science History Publications, New York City, 1976, page 7. The founder who absolutely personifies the union of the scientific and political Enlightenments is Benjamin Franklin. His experiments with electricity were at the cutting edge of science in his time. Pulitzer prize winning historian Joseph Ellis has written that Franklin today would be the equivalent of a Nobel Prize winning scientist. In fact, Franklin was actually given, in 1753, what was then the most prestigious award for scientific achievement in the world: the Copley Gold Medal, by the Royal Society in London. In 1743, Franklin proposed the creation of the American Philosophical Society, modeled on his earlier "Proposal for Promoting Useful Knowledge Among the British Plantations in North America.'' Note the inclusion of the phrase "Useful Knowledge" in Franklin's original proposal. According to the bylaws formulated by Franklin, there were always to be, among the members of the Society, "a physician, a botanist, a mathematician, a chemist, a mechanician, a geographer, and a general natural philosopher.'' In the mid-1700s, these were all leading positions of scientific inquiry and activity. The members of the Society, Franklin stipulated, were to gather and share information concerning "all philosophical experiments that let light into the nature of things, tend to increase the power of man over matter, and multiply the conveniences or pleasures of life.'' That meant monitoring closely developments in horticulture, botany, animal husbandry, geology, mines and minerals, advances in mathematics and chemistry, useful inventions and improvements in labor-saving mechanical devices of all types, new processes and techniques of manufactures, surveys, maps and charts, and geology. Franklin would later put forward a similar proposal for an Academy of higher learning in Philadelphia; this would eventually become the University of Pennsylvania, which today proudly claims Franklin as its founder. Another founding member of the American Philosophical Society was Franklin�s friend, John Bartram, at the time perhaps the world's leading botanist and horticulturist. Carl Linnaeus, the Swedish botanist and zoologist who created the modern biological naming scheme of using two Latin grammatical forms (for example, Acer saccharum is the scientific name for the sugar maple tree) called Bartram the "greatest natural botanist in the world." Bartram's 8-acre botanic garden, on the west bank of the Schuylkill River about three miles southwest from the center of Philadelphia, is considered to be the first scientific botanic collection in North America. Bartram died in 1777, so he did not play much of a role in the Revolution. The third leader in establishing the American Philosophical Society was another friend of Franklin, Dr. Thomas Bond, a leading physician and surgeon of the time. According to Wikipedia, Dr. Bond has been called the "Father of Clinical Medicine." He developed an effective splint for fractures of the lower arm, which became known as a "Bond splint." Recall that in this era, fractured limbs often resulted in gangrene and loss of the limb, and very often, death. The medical profession, at that time was considered to be one of the most important in science. In 1750, Dr. Bond sought the assistance of Franklin in establishing the Pennsylvania Hospital in Philadelphia, the first medical facility in the American colonies. According to Wikipedia, the Hospital "quickly drew attention as a center for medical advancement, especially in maternity care and the humane treatment of mental illness, a poorly understood area of medicine at the time." A list of the earliest members of the American Philosophical Society speaks for itself: George Washington, John Adams, Thomas Jefferson, Alexander Hamilton, Thomas Paine, James Madison, Marquis de Lafayette, Baron von Steuben, Tadeusz Kosciuszko, James McHenry, David Rittenhouse, Nicholas Biddle, Owen Biddle, Benjamin Rush, and John Marshall. David Rittenhouse was another close friend of Franklin He was a surveyor, mathematician, inventor, clockmaker, designer and manufacturer of scientific instruments, and the foremost astronomer in North America. He surveyed and marked the 12-mile circle centered on the Court House in New Castle, Delaware, which comprises the northern border of Delaware. He also surveyed parts of the boundaries of New Jersey, New York and Pennsylvania. 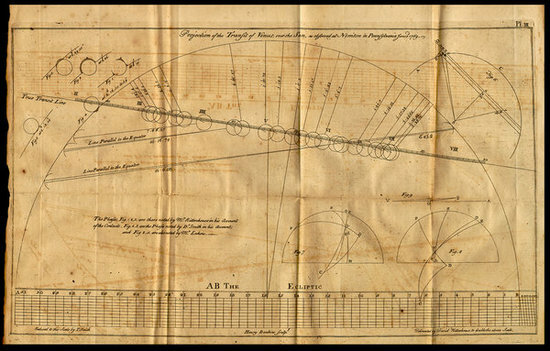 The drawing of the 1769 transit of Venus made by David Rittenhouse for the American Philosophical Society. Source: Wikipedia. Owen Biddle, Sr. was, like Rittenhouse, a clockmaker, watchmaker, and an astronomer. He became involved in the Revolutionary cause as early as 1765, when he signed the Non-importation Resolutions of October 25. He served on the Committee of Safety, then on the Council of Safety. These were the organizations that exercised de facto political and administrative control of the various colonies, as the royal governors lost influence and power. Biddle was a member of the Pennsylvania Constitutional Convention of July 15, 1776. In June, 1777, the Continental Congress appointed Biddle as Deputy Commissary General of Forage for the Continental Army, with the rank of colonel. Biddle was another member of the special committee of the American Philosophical Society to observe and report on the June 3, 1769 transit of Venus. In 1782, Biddle was elected a member of the American Academy of Arts and Sciences, two years after that organization was founded by the Massachusetts legislature, with a Charter of Incorporation instructing it "to cultivate every art and science which may tend to advance the interest, honor, dignity, and happiness of a free, independent, and virtuous people." Wisdom and knowledge, as well as virtue, diffused generally among the body of the people being necessary for the preservation of their rights and liberties; and as these depend on spreading the opportunities and advantages of education in various parts of the country, and among the different orders of the people, it shall be the duty of legislators and magistrates in all future periods of this commonwealth to cherish the interests of literature and the sciences, and all seminaries of them, especially the university at Cambridge, public schools, and grammar schools in the towns; to encourage private societies and public institutions, rewards and immunities, for the promotion of agriculture, arts, sciences, commerce, trades, manufactures, and a natural history of the country; to countenance and inculcate the principles of humanity and general benevolence, public and private charity, industry and frugality, honesty and punctuality in their dealings, sincerity, good humor, and all social affections, and generous sentiments among the people. "Cherish the interests of literature and the sciences"! Compare that to the anti-science political hooliganism of conservatives, Tea-baggers, and Republicans today. At six minutes into Particle Fever, Levinson and Kaplan include two clips of Republican Congressmen, Sherwood Boehlert and Joel Hefly, speaking on the floor of the House in 1992 against the Superconducting Super Collider, then in process of construction near Waxahachie, Texas. The Superconducting Super Collider had a planned ring circumference of 54 miles, and would have collided particles with an energy of 20 terravolts per proton, nearly three times the level possible with the Hadron Large Collider at CERN. But the US Congress voted to cut all funding for the Superconducting Super Collider in 1993, and it was abandoned long before being completed. It would, of course, have come online and made possible the Higgs boson experiments probably a full decade before the CERN HLC. 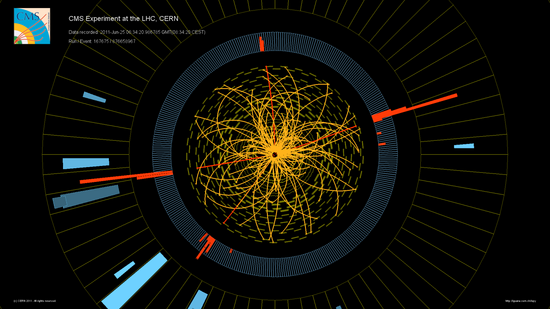 Of course, no one talks about a "lost decade" of basic research in particle physics. Only the "lost decade" in Japan -- during which financiers and usurers were unable to keep pumping up the values of the assets they held. "Rewards and immunities, for the promotion of agriculture, arts, sciences, commerce, trades, manufactures, and a natural history of the country." "Busting sod" in 1910 with a steam traction engine manufactured by the Geiser Co., Waynesboro, Penn. Note the men in front of and besides the large rear wheel. From the files of my business, Nation Builder Books. Liberty cannot be preserved without a general knowledge among the people, who have a right, from the frame of their nature, to knowledge, as their great Creator, who does nothing in vain, has given them understandings, and a desire to know; but besides this, they have a right, an indisputable, unalienable, indefeasible, divine right to that most dreaded and envied kind of knowledge, I mean, of the characters and conduct of their rulers�. The preservation of the means of knowledge among the lowest ranks is of more importance to the public than all the property of all the rich men in the country. Does this sound like a guy intent on erecting a new exploitative economic regime geared toward grinding down and exploiting working men and women? "Their great Creator." I want to discuss that whole idea of God a bit, because it is central to the Enlightenment belief in science and self-government. The key concepts here are the divine spark of reason, and Imago Dei, man created in the image of God. These concepts were the foundation of the Enlightenment and the development of science. Basically, the Enlightenment was based on the belief that God was not arbitrary and capricious, and the universe was therefore created lawfully (that is, according to invariable laws, i.e., two plus two will always equal four, or the square of the hypotenuse of a right triangle will always be equal to the sum of the squares of the other two sides); that man is a creature of reason, and can thus inquire into and understand the laws of creation. Or put it this way: we can inquire into and understand the laws of physics, hydrodynamics, aerodynamics, and so on. This capacity for reason and understanding creation is what makes each individual precious and unique. It is why we assert that "all men are created equal." This Enlightenment view of science permeated the society. Here is part of a sermon, entitled "The Dignity of Man," delivered in Franklin, Massachusetts in 1786. The good people of Franklin, it appears, having honored the great man by naming their town after him, were in turn honored by him. The full subtitle I think points to how this whole concept characterized the epoch: "A Discourse Addressed to the Congregation in Franklin, Upon the Occasion of Their receiving from Dr. Franklin, the Mark of his Respect, in a Rich Donation of Books, Appropriated to the Use of a Parish-Library." ...what has been said concerning the nature and dignity of man, shows us, that we are under indispensable obligations to cultivate and improve our minds in all the branches of human knowledge. All our natural powers are so many talents, which, in their own nature, lay us under moral obligation to improve them to the best advantage. Being men, we are obliged to act like men, and not like the horse or the mule which have no understanding. Besides, knowledge, next to religion, is the brightest ornament of human nature. Knowledge strengthens, enlarges, and softens the human soul, and sets its beauty and dignity in the fairest light. Learning hath made astonishing distinctions among the different nations of the earth. Those nations, who have lived under the warm and enlightening beams of science, have appeared like a superior order of beings, in comparison with those, who have dragged out their lives under the cold and dark shades of ignorance.... the cultivation and improvement of the mind is more necessary for use, than for ornament. We were made for usefulness and not for amusement. We were made to be the servants of God, and of each other. We were made to live an active, diligent, and useful life. As men therefore we cannot reach the end of our being, without cultivating all our mental powers, in order to furnish ourselves for the most extensive service in our day and generation. Knowledge and learning are useful in every station; and in the higher and more important departments of life, they are absolutely and indispensably necessary. In developing, acquiring, mastering, and diffusing that science and technology, we are acting God-like; we are acting in the image of the Creator, by ourselves creating new knowledge, and new uses of that knowledge. The idea that every individual human being is endowed with the divine spark of reason, and therefore can act God-like -- can, in fact, participate in the ongoing work of Creation, by him- or herself creating or assimilating, and using new scientific knowledge -- is the bedrock for the idea of a republic of self-governing citizens. And Creation is an ongoing process. So, it simply does not square easily with the mindset of a conservative. The foundational statement of modern American conservatism is William Buckley's "standing astride history and yelling 'Stop!'" If the whole idea of being human is to act in the image of God and create new knowledge, if the whole idea of a republic is to nurture and protect those engaged in this noble quest, then how can Buckley's conservatism be anything other than a repudiation of God, and the most noble aspects of humanity: reason, and science? But, what are we supposed to do with all this new scientific knowledge? Well, it says right in the Preamble of the Constitution: promote the general welfare. Well, OK, but what, exactly, is "the general welfare"? Who decides what it is? Do any of us have any say in deciding what is "the general welfare"? The Framers certainly thought "the General Welfare" was important. They included the phrase in Constitution twice -- first in the Preamble, as a statement of the purpose of the Constitution, and then again in Article I, Section 8, which established the broad powers of Congress to "provide for the General Welfare." It is interesting that the Articles of Confederation omitted the phrase, despite Franklin's attempt to include it. So, when the time came to remedy the weaknesses of the Articles of Confederation, the phrase "the General Welfare" was included twice. It is further interesting that when the Confederate States wrote their constitution, they mostly copied the US Constitution word for word, with some notable changes and omissions. Among these is dropping the phrase "general welfare" entirely. (Another interesting change, given the machinations of Republicans today to destroy the U.S. postal service, was that the Confederates stipulated in their constitution that their postal service must pay its own way.). Today, political conservatives and libertarians explicitly denounce the idea of the general welfare as the "slippery slope" to tyranny. The terms 'general welfare' were doubtless intended to signify more than as expressed or imported in those which Preceded; otherwise numerous exigencies incident to the affairs of a nation would have been left without a provision. The phrase is as comprehensive as any that could have been used; because it was not fit that the constitutional authority of the Union, to appropriate its revenues shou'd have been restricted within narrower limits than the 'General Welfare' and because this necessarily embraces a vast variety of particulars, which are susceptible neither of specification nor of definition. It is therefore of necessity left to the discretion of the National Legislature, to pronounce, upon the objects, which concern the general Welfare, and for which under that description, an appropriation of money is requisite and proper. And there seems to be no room for a doubt that whatever concerns the general interests of learning of Agriculture or Manufactures and of Commerce are within the sphere of the national Council as far as regards an application of Money." "Left to the discretion of the National Legislature." This is really interesting, because now we have to discuss the proper role of politics in governing a republic, and how the shift from a market economy to a market society (Michael J. Sandel, a political philosopher at Harvard, is the author of What Money Can�t Buy: The Moral Limits of Markets), abrogates that role. As I wrote above, the development of new science and technology is the most important economic activity any society can undertake. Without new science and technology, economic collapse is inevitable. But scientific and technological knowledge is always changing. Or, it should be, as science and technology advance. So, in a republic, the highest duty of a statesman is to understand the present frontiers of science of technology, and where the boundaries of those frontiers must be expanded in order to find the answers to looming, as well as existing, economic and social problems. For example, we face a terrible crises of man-made climate change. But, we have available a wide range of new technologies that can stop, and even reverse climate change. The development, dissemination, and application of this new scientific and technological knowledge should be the highest priority. So, it is the role of Congress to determine exactly what is the General Welfare -- and what the nation as a whole, acting through the social compact of the national government, can do to promote the General Welfare. In times past, this meant, in the 1790s, hiring geometers and surveyors and mathematicians and cartographers to chart the hazards of coastal waters, and to build lighthouses; in the early 1800s sending out Army expeditions to explore and map the west; in the 1820s, outright financing of the building of The National Road; in the 1840s, giving money outright to Samuel Morse to develop the telegraph; in the 1850s and 1860s, giving millions of acres of the public land away, free, to companies in exchange for their promise to build railroads; in the 1910s, paving roads and building bridges to facilitate the use of new fangled motor vehicles; in the 1920s, supporting the development of aviation with lucrative mail carrier routes; in the 1930s, bringing electricity to rural areas that privately owned power companies could not see a profit providing service to; in the 1950s, building an interstate highway system; in the 1960s, kick-starting applied scientific research by making a commitment to a manned moon landing; in the 1970s and 1980s, funding the development of things called routers, TCIP, and ARPAnet. If you didn�t like what the Congress had decided was the General Welfare, then you could vote the bums out in the next election. That�s the role of politics in a republic. Then Reagan came into office, and we got crammed down our throats the very un-American idea that the national government can�t do anything right. That it should just plain keep its nose out of the economy. Now, there is no real role for politics � all the decisions about our collective futures are supposed to be made by the new right-wing, neo-liberal deity, The Market. Do we need to promote the General Welfare by implementing a crash program to build wind power and solar energy? Sorry, only The Market can decide that. Yeah, it�s great that we have two or three states now that can get over half the electricity from wind and solar on a good day. For me, that�s where we should have been ten years ago. Do we need to promote the General Welfare by building a high speed passenger rail system? Sorry, only The Market can decide whether we should do that, and look at how many people are voting economically by driving cars. In the meantime, the Japanese have been running their 150�200 mph Shinkansen since 1964. We have a trade deficit with Japan now? And you don�t think the two are related in any way? This is why I feel betrayed by President Obama. He came into office with a huge mandate, with his party in control of both houses of Congress, and with a public mood, -- in reaction to the financial collapse of 2007-2008 -- that had finally been broken from the cultural �worship of riches� we have had to endure since Reagan. Rather than draw upon the rich and powerful Enlightenment tradition of the American Revolution, in which government was established as a force to do good, he sided with our �domestic enemies�, the financiers, rentiers, and usurers of Wall Street (�I�m the only thing standing between you and the pitchforks,� he literally told them) to save their morally bankrupt system � a system that is destroying us from within. There is much more to the neat little package I want, tying together the creation of the United States as a constitutional republic, what the political economy of a republic should be, and the centrality of science to republican political economy. The discussion of the general welfare must be expanded, to include its corollary, the Constitutional concept of implied powers. My first cut at that was in November 2011, in Constitutional Foundation of the US Economy: Powers are Implied Not Enumerated. A short extract I posted as a recent comment is here. The de-industrialization of the US economy over the past half century is the inevitable result of not knowing what the political economy of a republic is supposed to be. Rentiers, speculators, and usurers have no place in the properly functioning economy of a republic; they must be rooted out and destroyed ruthlessly. Financiers do have a role, and it is not unimportant. However, their activities must be closely monitored and tightly regulated. The issue is quite simple: the creation and allocation of money and credit must be organized and regulated in such a way that it promotes the general welfare, not just private gain. There is room for private gain; in fact capitalism remains the best form of organizing most (note: most, not all) of an economy. Alexander Hamilton laid down a short and simple test in The Federalist Number 15: �Is private credit the friend and patron of industry?� In June 2012, in Neo-liberalism, De-capitalization/De-industrialization, and the Res Publica, I posted the evidence that in fact, the financial system is the enemy of industry: the United States is becoming less capital intense. It is becoming, in other words, less capitalistic. In another recent comment, I posted a series of graphs that I used in that piece showing the de-capitalization of the US economy. We need an economy in which real capitalists can profit and flourish, not rentiers, usurers, and speculators. I love this photo; it make me sniffle every time I see it. 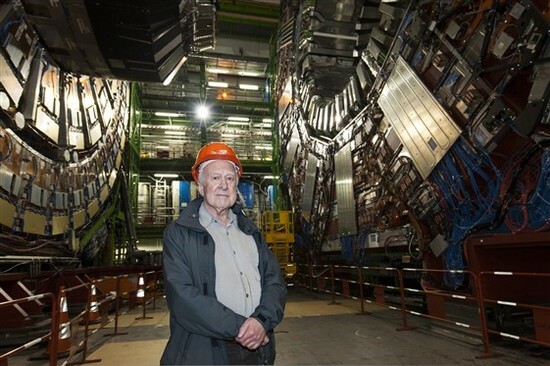 This is physicist Peter Higgs, in his eighties, shown on site at one of the massive instrumentation clusters at the CERN LHC. May we all be so blessed to live to see such powerful validation of our life's work. 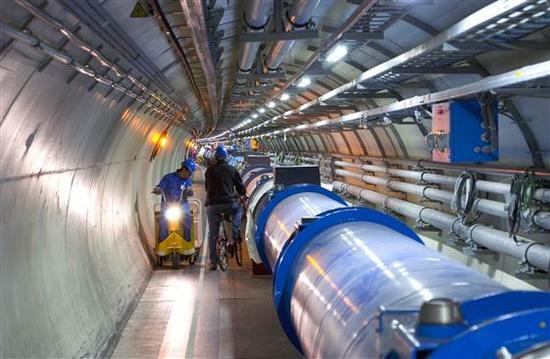 Source: CERN Press Office Photo Selection.